Today started off like any other; I woke up, had breakfast, fed Chiron and went to check on the farm! It was still pretty dark, but with the newly erected wall on the beach side providing illumination, I didn't really notice. I went to check on the gate to make sure it still worked... Or more accurately, it wasn't in a large Creeper-sized hole! It was still there, it was still working and it was still closed! That was one thing from my mind. I didn't care what was outside those walls; as long as I was inside them there could be a zombie war and I'd be safe! As I said yesterday, I decided that today would be a day to check on the mineshafts; illuminate every tunnel, cut off any water access and generally ensure it is safe. However, I decided to check on the forge first. Like with the gate, I wanted to make sure it was still in one piece. Not because of Creepers or anything... Just the fact that a large lava pit dominated the central square! It began to rain just as I got back onto the porch from the stairs, but I thought nothing of it. Continuing around, I admired my wall, extending out along the beach head, and then turned my attention to the forge: intact! 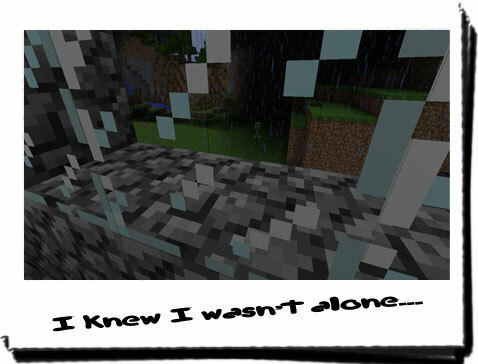 It was a Creeper... Moving around, outside the forge... Less than 30 metres away... It didn't see me, but I got a good look at it; it was a strange creature that seemed to have no arms or forelegs. Having said that, when it moved it had 2 pairs of legs!!! It was odd; it looked like it was standing up, but the position of the four legs seemed natural?!?! It moved from spot to spot with quick and fluid motion, and it's face seemed stuck in a constant gaping maw! It would move around for a bit, stop periodically and look around. Then it would begin moving around and then repeat. It didn't look like it was doing anything! At some point, I think something caught its attention because it started hopping quite high into the air, and then scuttled quickly off under the cliff to the East! I slumped down under the window, totally aghast... I didn't know what to think; that was the same creature I had seen about a week ago! And there was another one, in the open! I stood up on shaky legs and managed to make it back down to the door. Then an idea struck: if it was wandering around, there may be more! With renewed energy, I ran straight back to the house, getting totally soaked by the rain. Mining be damned; there was a wall to finish! I went straight to the chest that I had filled with stone and took all of it out and put it into a minecart I had spare. I then wheeled the stone-laden cart slowly outside and down the steps, towards the far end of the beach-side wall. I needed to enclose my area quickly and ensure that everything was fully illuminated and was in visual range of the house! Thanfully it had stopped raining by this point, but I had to overcome another problem whereby, the wall was too low to join onto the flat field near to the forge. I either continued at the same height and spent a lot of time digging, or I raised the level of the wall! I decided with the latter; there was no way I was going to compromise the security of this wall! Within an hour, I had raised the wall 2 metres so it joined with the flat field via a small slope that joined with the beach! 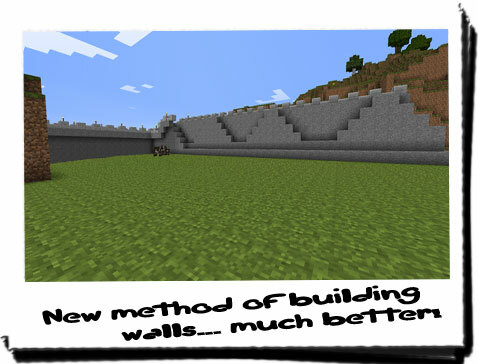 I then continued the wall along for a very long time, building a basic foundation to get an idea about how far I would need to extend the wall. All the while I kept an eye out for Creepers; as I had seen one twice now, they could be anywhere, even in the day! The building of the wall was taking far too long though; by just after midday I had barely made any progress, so I decided to employ a different tactic! I would create a basic staircase into the wall which would allow me to build the sides incredibly quickly without constantly relying on scaffolding! It seemed simple, and after an hour of attempting this new method, I was astounded at the rapid progress I was making! After awhile of wall building, I realised how carried away I had gotten and noticed that I hadn't left enough room for a future project. I needed to further extend the wall, but in the opposite direction! It had started raining again and by this time I was incredibly tired. The only thing keeping me going was the thought of being safe! I altered the extension direction to enclose a greater area of the flat plain, and within a few hours, I had this bit done! It was then that I decided that another tower placed on top of this corner wall would give an ample viewpoint to spot things in different directions. 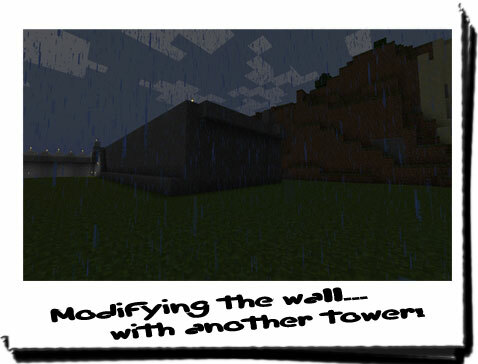 I was still toying with the idea of turning them from lookout posts into actual proper towers! But the actual wall itself held a greater priority! By this time, it had already started getting dark, so I left the minecart where it was, and returned to the house. 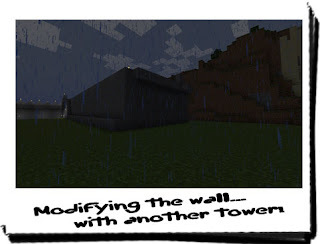 I was soaked to the bone when I eventually got back, but it had given me enough time to determine the effectiveness of the wall. It was tall, long and strong. That and the brilliant illumination made it a very effective barrier to whatever is in this land!